Marrakech (مراكش), also known as Marrakesh, is one of the imperial cities of Morocco. The name Marrakech originates from the Amazigh (Berber) words amur (n) kush, which means "Land of God." It is the third largest city in Morocco, after Casablanca and Fez, and lies near the foothills of the snow-capped Atlas Mountains. It is a few hours from the foot of the Sahara Desert. Its location and contrasting landscape has made it an enviable destination in Morocco. The city is divided into two distinct parts: the Medina, the historical city, and the new European modern district called Gueliz or Ville Nouvelle. The Medina is full of intertwining narrow passageways and local shops full of character. In contrast, Gueliz plays host to modern restaurants, fast food chains and big brand stores. Marrakech has a hot semi-arid climate with the Atlas Mountains protecting it from the Sahara Desert. Temperature-wise Marrakech's climate resembles the one found in the interior of Andalusia in southern Spain, but precipitation-wise the city has far less rainfall, averaging around 280 milimeters (11 inches) annually. Summers are long and hot with virtually zero rainfall and temperatures in July are usually well above 35°C (95°F) during the day but cool to around 20°C (68°F) during the night. That's why the city really comes alive after sunset. Heat waves hit Marrakech every year and some can be so hot that the mercury can climb above 45°C (112°F). The record high is 49.6°C (121.3°F). Winters on the other hand are marked by drastic temperature variations. While the average high in January is 18°C (64°F), the average low is 5°C (42°F), meaning that all types of clothing will be needed if one intends to visit Marrakech during the winter. Temperatures below 0°C (32°F) however, are extremely rare and the record low is -3°C (26°F). While snow doesn't fall in the city itself, many of the residents head to the Oukaimeden Ski Resort (78km to the south inside the Atlas Mountains), where snow is seen every year. Most precipitation also falls during winter and autumn. Marrakech-Menara Airport (IATA: RAK), ☎+212 4444 7910, +212 4444 78 65, +212 4444 8506. Marrakech has an international airport with direct scheduled flights from London, Dublin, Oslo, Copenhagen, Stockholm, Paris, Madrid, and many charter flights arriving from all over Europe. If you are flying from the US, Canada, Asia or elsewhere, you'll have to change planes in Casablanca. Plenty of low cost companies fly to Marrakech. Some companies fly to Casablanca, where a plane change for the 45 min flight to Marrakech can be made. From the UK, easyJet flies to Marrakech from Manchester, Bristol, London Stansted and Gatwick Airport (and also from Madrid and from Lyon). Ryanair has direct flights from Oporto (Portugal), Luton, Dublin, and Stansted to Marrakech. They also fly from Frankfurt-Hahn (Germany), Alicante (Spain), Girona (Spain), Madrid, Reus (Spain), and Rome Ciampino (Italy) to Marrakech. Thomson Airways travels from London Gatwick and Manchester. British Airways began flying from London Gatwick in 2011 and now have a daily service to Marrakech. Atlas Blue airlines was once a low cost carrier but was merged into Royal Air Maroc in 2010. Transavia.com is a new low cost carrier from the Air France-KLM group coming to Marrakech from several cities in Europe like Paris. Norwegian offers direct flights from Copenhagen, Oslo and Stockholm. Iberia offers two non stop flights from Madrid. TAP Portugal offers direct flights from Lisbon. From inside Morocco, you can take Royal Air Morocco, with flights from Agadir, Casablanca (daily), Fez (daily), Ouarzazate, Al Hoceima, and Tangier. Terminal 1 (the international terminal) has two money changing outlets in the Arrivals hall and one in Departures. There is an ATM in Terminal 1 but it is located *after* the customs inspection, you cannot see it from the baggage claim. Terminal 2 had ATMs but (as of March 2012) is being re-built from the ground up. On ATMs, check for the Maestro, Cirrus or Plus logos to be sure that the machine accepts foreign credit cards. Some of the ATMs work only in French. If your card is taken at the ATM, tell airport security and they can help you get it back. ATMs generally dispense only MAD100 and MAD200 banknotes so getting change for small everyday purchases like water, taxis, etc. can be a challenge. There is a patisserie outside of the customs exit in the international terminal, but the cashier will complain if you try to change large bills. At weekends you may have difficulty acquiring cash as machines are not generally restocked until the following Monday. Sometimes your card may work in some machines and not others, or may support smaller withdrawals rather than larger ones, and may work at some times and not others. You should have a backup means of funding your visit. ATMs usually dispense a maximum of MAD2000 but other limits may apply dependent on your bank. INWI has a booth in the arrival hall where you can purchase a SIM card for your unlocked phone (they can punch micro SIMs). Ten GB of data for MAD100. Coverage is 4G. It's very valuable for GPS navigation in the souks. On both arrival and departure you will be required to fill out a form with passport details. It is useful to bring your own pen as there are none available in the terminal. Organization at the airport can be chaotic at times and not within western standards. When leaving from Marrakech, think about arriving 3h prior to departure to have a stress-free flight. Check-In/bagdrop isn't handled in an efficient manner (easily 1h waiting time) and after that there are multiple checkpoints which too can be bottlenecks. The taxi stand at the airport is run by dishonest drivers. The price on the meter to the airport is MAD15. The official posted price is four times that, MAD60, and even this is not enough for these greedy people, they may demand much higher prices. They will try to point at the wrong sign showing MAD100 (which is for a place 20km away) or ask for more because it's night, or because it's a special religious holiday, or because the official prices have just been raised but aren't yet shown on the official sign. The best way to deal with them is to ignore the stand just outside the terminal; walk across the car park where you will find many more taxis waiting. Offer them MAD40, they will say "no, that's ridiculous, etc.," but once you start walking away towards the roundabout one of them will pull up behind you and say "ok, MAD50". The Brigade Touristique at the airport ignores complaints about this abuse of tourists although it is their job to prevent it. If you want to save money you can walk to the roundabout (10-15 mins) just outside the airport and catch a taxi from there for the metered fare (MAD15-20 to the old town/Gueliz/Medina). The cheapest local option is to stop a grand-taxi at the roundabout which is already travelling in the direction of the city. (Coming from the airport second exit from the roundabout) The cost will be 5MAD per seat which is the normal local price (Jan 2018) The Taxi will drop you at the grand-taxi hub on the street Rue Ibn Rochd. Be aware you will share the taxi with other people and if your luggage occupies seats you may be charged for that. If you don't have much luggage then it's possible to walk from the airport to the Medina even though it will take you from an hour and half to two hours. There is a footpath alongside the road all the way, and the minaret of the Koutoubia mosque provides an excellent landmark to head towards. If you have enough time you can break the trip with a visit to the Menara gardens, which are between the airport and the city. The No 19 Airport express bus is MAD30, with a free return trip if it is within 2 weeks of the initial purchase (keep your receipt). It serves all the major hotels and is a great way to go from the airport to the hotels. You can easily find its departure stop, to the left of the road immediately outside of the Arrivals Hall at Terminal 2, after the taxis. The bus leaves the airport every half an hour between 07:00 and 21:30. The bus has no particular stops except Jeema El Fna and can stop anywhere on the route. The driver has a small map to hand out and you can tell the driver the hotel you're heading to. The airport is about 5 km (3 miles) from the city, which is about a 15-20 min ride by "petit taxi." Petits taxis are small or normal size cars that go to destinations within the city and charge a lower price than the larger "grands taxis," which go between cities. If you leave from the airport by petit taxi, agree on the price beforehand or, better yet, have the driver use his meter (a taxi ride to Ville Nouvelle or to Medina from the airport should be Dh 50-80, more at night). In practice, most petit taxi drivers have agreed among themselves to an artificially high rate to or from the airport: Most will quote you Dh 100 each way and half again that much at night. They can be very pushy and like to get you locked inside the vehicle before they reveal the price and will always demand the fare up front. You should never pay more than Dh 60 (the official price which is already 3 times the meter fare) from the airport to the centre of the city for a petit taxi. If you don't mind walking 800m (about a 10-minute walk), you can avoid the thieves altogether by catching a petit taxi at the roundabout. Tell them where you want to go and check that they switch on the meter (about 15-20dh). If they ask "first time in Morocco" always say no, I have come to Morocco many times, I have family/friends in Casablanca or Agadir, etc. This discourages them from ripping you off. You can usually get a driver to take you into the centre from the airport for 40-50dh simply by being prepared to haggle, be patient and play the game. Walk to the other side of the car park as the taxis just outside the terminal are the most aggressive and dishonest, and they work together as a cartel. Once they see you walking away towards the roundabout, they will come down to 40dh. You can also take a grand-taxi from the roundabout at the airport which will cost you 5DH per seat to the city centre where you get dropped at Rue Ibn Rochd. If you don't want to play this game, you can call Taxis Verts (a cab company, 05 24 40 94 94). Meter is compulsory for them; they should have a sticker on the windshield with their tariffs. They will take you at the drop-off, which is at the level of the parking, 50 m in front of you outside the terminal. The fare is around 70-80 Dh for La Palmeraie and 30-40 Dh for the centre. Always ask the meter! You can also book a fixed-rate taxi in advance through a reputable taxi company. TangierTaxi gets good reviews. If you are travelling from the airport to somewhere further afield (such as Essaouira), your hotel or guest house may be able to arrange a grand taxi to pick you up at the airport and charge a fixed price for the journey. Grands taxis are generally more expensive than petits taxis, but they are allowed to take up to 6 passengers rather than 3 and they are a bit bigger. It avoids hassle, as it's not always easy to haggle with a taxi driver after staggering off a long plane ride half-asleep. Note that Grande taxis are not air conditioned. Private airport transfers can be arranged via Marrakech Airport transfer with the cost being 10.00 euro in total for up to 4 people, to hotels in Marrakech Medina, Hivernage, Gueliz. Transfers to Palmeriae Hotels & other destinations are also available. The cost includes an air conditioned vehicle, free child car booster seats & the driver waits for you at the airport, even if your flight is delayed. Several international rental car companies are based at the airport as well. The train station is in the recently developed Guéliz district at Avenue Hassan II, ☎ +212 447768. For train times and schedules, check out the Moroccan Railway website www.oncf.ma. That train station has ATMs, an INWI cellphone store (purchase a SIM here), a post office, and cafes. Tickets for the trains can be purchased from a person at the guichets or from an ONCF kiosk which accepts credit cards (French and English). Supratours has an office where you can purchase bus tickets. Trains from Casablanca (2nd class Dh84; 1st class Dh150, 3 hours), Rabat and Tangier connect with most domestic rail destinations in the country, with Marrakech as the southernmost stop. Trains run regularly between Marrakech and Casablanca (including the International Airport). They arrive around every two hours and regularly from other destinations like Rabat. Every day there are 8 direct 7-hour trains to Fez via Casablanca Voyageurs station and another two direct connections to Tangier. Tangier: For those wishing to travel by train from Tangier it's about a 10-hour journey. You can travel either by day or night train. During the day, you will need to change trains for a connection halfway through the journey, creating a break for about 30 mins. The night trains which leave for Marrakech from Tangier travel straight through to Marrakech without the need for a connection. The night trains have sleeper cars on board, though you will need to pay extra for these (around Dh 350). If you're planning to go cheap and take the night train on the regular seats in second class (and planning to sleep...), you'll be interrupted by passenger movement and a few times by the ticket conductors throughout the night. Bottom line: It's a great way to go but (especially if you're traveling alone) don't plan on sleeping on the train. There is currently no train line further south than Marrakech in Morocco; if you want to head south, to the desert, Atlas Mountains, Agadir or Essaouira on the coast, you'll have to get a bus, rental car or grand taxi. Travel tips: Moroccan trains do not have restaurant cars. A snack trolley makes the rounds with sandwiches, soft drinks and coffee, but bringing food for the journey isn't a bad idea. Stops in Casablanca and Rabat usually are long enough to grab a bite in the station. There are many long distance bus companies operating in Morocco which serve Marrakech and other cities. The recommended bus companies for tourists are CTM, Pullman du sud and Supratours. Other companies exist, though these three companies are usually your safest options. There is a Supratours office inside the main hall of the Marrakech railway station. CTM bus tickets can be bought upstairs in the Telephone place on Rue Bab Agnaou off the main square (look for a neon telephone on the top of the building) and an Eservice shop (look for a yellow sign) on an alleyway just off the same road, opposite Restaurant Omar. Most ALSA (local destination bus company) and private bus lines arrive at the long distance bus station near Bab Doukkala, a 20-min walk (Dh 15-20 by petit taxi) from Djemaa El-Fna. Supratours and Eurolines buses operate from here. It's the place to take the buses from the small companies that go directly to small destinations. The long distance bus station, CTM and private bus companies travel to destinations such as Agadir, Safi, Casablanca, El Jadida, Essaouira, Fez, Meknes, Ouarzazate, Rabat, and Taroudant. Taxi touts will often gather in the bus station to convince you that a bus to your destination is 'full', to steer you into a grand taxi, and to attempt to sell you goods as your taxi is prepared. This can be difficult if there is nobody manning the ticket desks, and the best option is to walk out of the station to the coaches -- a ticket can usually be purchased from a conductor on board. For trips to Meknes (6h, ~120 Dh) be advised that while seemingly shorter on the map, the mountain route via Beni Millal takes at least 2 hours more than on the highway via Rabat and Casa. Going there by train (6½h, 174 Dh) is the most comfortable option, although buses might be slightly quicker. For those interested in overnight transit to Tangier, there is an overnight bus that leaves the main bus station at midnight every night (8h, 160 Dh). This is a great alternative for the overnight train to Tangier, as there's no need to transfer, the bus is almost nonstop (besides one or two breaks), and the journey is 2 hours shorter than the overnight train. Tickets can be purchased at the long-distance bus station (look for the ticket window operating buses to Rabat). CTM also operates overnight services to Tangier (9h, ~220 Dh). CTM operates a new bus station "Gare Voyageurs" one block south from the Supratour station next to the train station. It's better to take the buses there, because you can buy the tickets in advance. Besides, the CTM's offices there are better and there are no people trying to push you to their bus company. The office and station once on Zerktouni street do not exist anymore. CTM has an office at the long distance bus station (see above) if you just want to buy your tickets in advance or check the schedule. A taxi between the CTM bus station and the Medina should cost about 35dh. Trekking in the Sahara is a great experience. Walking, camel, horse treks and ATVs are plentiful and natural to this locale. Once in the medina, everything can be seen on foot, though you'll be doing a lot of walking. GPS is invaluable if you do not want to constantly rely on the help of locals to find your way. For exploring more of the city, buses and petits taxis are plentiful. There is a free travel guide and map application for Marrakech, called Marrakech Riad Travel Guide (you can look it up in the App Store), that can help you NOT to get completely lost in the medina. It uses GPS signal so there is also NO charge for using it and it also includes important places and some restaurants to visit. No 18 - Outside of Airport to Djemaa el-Fna. Bus No 19 leaves Djemaa el-Fna every half an hour, starting at 6:15AM in the morning until 9:15PM. The trip to the airport takes about 25 minutes. There is an open-topped City Sightseeing bus that will take you around the outskirts of the city, with commentary provided via headphones (supplied with your ticket) in 8 languages. The best place to catch it is from the coach stops by Square de Foucauld. Tickets cost Dh 168 each and are valid for 48 hours from the time of issue, no matter how many times you get on or off. However, check the timetable carefully: the buses can stop running earlier than you might think. The company has an app, but there are many reports of problems with it -including buying tickets. Simply buy your ticket on the bus and get the free map with all stops listed. An alternative and romantic way to travel is by caleche -- pronounced kutchee -- a small horse-drawn carriage. They can be hired at Square de Foucauld (the small park at the bottom of Djemaa El-Fna). It's wise to agree on a price before setting off. As a guide price, you should pay around DH 150 per hour, per carriage. They will hustle you to charge for everything such as bags. But you don't need to pay for extras. For petit taxi, the maximum number of passengers is three (plus the driver). Sometimes you need to share with other passengers. If you are a group of two or three people, you just pay the one price and share with others (example, 10Dh for three passengers). Generally during the daytime you will pay about 10dh; at night you should pay no more than 20dh. The minimum charge is Dh7 before 8pm and after will be 10Dh. Dh 20 is a good price for a 10 min ride. For Grand Taxis (regular Mercedes taxis) there are no meters. Typically the set rate from Marrakech Airport to the Medina or Jemaa el Fna (Main square) is 150Dh. The maximum amount of passengers that can be carried by a Grande taxi is 6 - 4 passengers in the back seats and 2 passengers in the single front passenger side seat. Outside of the airport if you are a group of more than three (the maximum for a Petit Taxi), then negotiate your fee before you enter the Grand Taxi. Always ask to use the meter (compteur in French); otherwise, you are contributing to a culture of ripping off people. During the day you can generally get them to use the meter (if they refuse, just get out, stop another one). Your mileage may vary; in September 2017 one author (a white American with broken French) tried to get about 25 different taxis to use the meter over the course of his trip and could not persuade a single one. At night, tell them "ashreen" (20dh). If you go to nightlife locations, avoid the taxis that are waiting outside as these are thieves and they can extort you. It's best to get the telephone number of someone honest and ask them to pick you up. Other locations where the thieves wait is near Jemaa el Fna square and at tourist sites. Here it is best to stop a taxi that is passing in the street and not those that are waiting. Generally the older and more beat up the taxi and the older the driver, the better. The less they talk the better (no "where are you from, first time in Morocco, etc."). There is much to see and do in Marrakech. An entire day can be dedicated to wandering around the souks and seeking out the best bargains. The city offers several historical and architectural sites as well as some interesting museums. Visit the Palmeraie Palmeraie is the green lung of Marrakech. It is a real oasis on the outskirts of the city. La Palmeraie covers 13,000ha and has about 150,000 palm trees and some hotels. It is the perfect place to take a nomadic space of a few hours during a camel ride. During the course of your 20km journey you can admire the palm trees, beautiful villas and with a little luck a international star resort in Marrakech ! Lesamateurs for thrills, Quad prefer to camels. The square of Djemaa El-Fna is the highlight of any Marrakech night. Musicians, dancers, and story tellers pack this square at the heart of the medina, filling it with a cacophony of drum beats and excited shouts. Scores of stalls sell a wide array of Moroccan fare (some overcharging heavily; see the Eat section) and you will almost certainly be accosted by women wanting to give you a henna tattoo. Enjoy the shows, but be prepared to give some dirhams to watch. By day it is largely filled with snake charmers and people with monkeys, as well as some of the more common stalls. Ignore anyone who offers you something that you do not want or move away: They will be asking you shortly for (too much) money. If you don't want to pay dearly for that henna or the photo of yourself with a monkey on your shoulder, politely decline when his owner approaches. The Souks (suuqs), or markets of Marrakech, just adjacent to Place Djemaa El-Fna, are where you can buy almost anything. 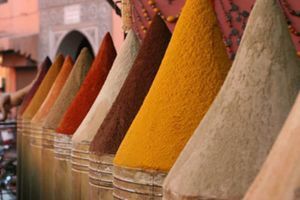 From spices to shoes, jellabas to kaftans, tea pots to tagines and much, much more. Undoubtedly, being a foreigner means you will end up paying higher prices than a native would, but bargain nonetheless. If you happen to run out of dirhams, you'll find plenty of people in the souks who will eagerly exchange your dollars or euros (though a fair rate here is less likely than at an official exchange). All that said, the sellers are much less aggressive than, say, Egypt or Turkey, so have fun! Tanneries Visiting the Tanneries can be an interesting experience. Even if some people tell you the area is only for locals, it is possible to visit the Tanneries without paying a youngster. After finding a Tannery, ask one of the workers if you can visit it and take pictures. The tanneries are at the east end of Avenue Bab El Dabbagh. That 'main' tannery, Dar Dbagh, where they seem to channel all the tourists is near the Bab Debbagh gate. You'll be quickly approached by a guide who'll give you a sprig of mint and tell you that the tour is no charge. At the end of the tour you may be asked for as much as MAD100 for a "tip". This is far too much (€9). Give no more than MAD10-20 and ignore the evil looks they may give you. If you hate or are bad at haggling, show them before the tour how much you will pay them. Koutoubia Mosque, right besides Djemaa El-Fna, is named after the booksellers market that used to be here. It is said that the minaret of the Koutoubia mosque is to Marrakech as the Eiffel Tower is to Paris. The minaret is visible from Gueliz which is connected to the Medina by Avenue Mohammed V. At night, the mosque is beautifully lit. As with most mosques in Morocco, non-Muslims are not allowed inside. Saadian Tombs were not discovered until the beginning of the 20th century. They have been preserved just like they were during the glory days of the Saadian rulers. Unlike the El Badi Palace, they were not destroyed, probably for superstitious reasons. The entrance was blocked so they remained untouched for hundreds of years. Inside you will find an overload of Zelij (Morrocan tiles) and some beautiful decoration. Once inside, you can expect to wait in line for about 45 minutes to see the most impressive tomb. While here, look for the tombs of Jews and Christians; they are noted by their different markings and direction of the tomb. MAD70 (as of Nov 2018). Majorelle Gardens , in Gueliz has an entrance fee of MAD70 and is more expensive than other attractions. It is somewhat overpriced for a modestly sized attraction that you can see in half an hour. However, it provides an excellent respite from the hustle and bustle of the city streets. The park boasts a collection of plants from across the globe, including what seems like every cactus species on the planet. Get here early to avoid the crowds. Inside the gardens is also the very small Berber Museum, for which an additional entrance fee of MAD30 is charged. The garden museum used to host a much larger collection, but the more interesting artifacts are now waiting to be displayed in a new museum next door when it is finished building in the next few years. The Majorelle Café inside the gardens is a pretty and quiet place to rest and get a drink and some food, albeit at very high prices. As you are a captive audience, don't expect to be served haute cuisine. There is a gift shop filled with fascinating period photographs for sale (80-100 years old), though items are far from cheap. Outside the Majorelle Gardens, expect to be harassed very aggressively by taxi drivers and trinket sellers. Be aware that the queues can be long and move slowly, so you might expect to wait in line for 30 minutes or more before entering. Dar Si Saïd Museum, on Rue Riad Zitoun Jdid has an entrance fee of Dh 25, is a museum 5 mins away from Djemaa El-Fna. Set in an old palace, it houses many different artifacts from Morocco through the ages, such as wood carvings, musical instruments, and weapons. It is dedicated to the Moroccan craft industry of wood, gathering a very beautiful collection of popular art: carpets, clothing, pottery and ceramics. All these objects are regional, coming from Marrakech and all the south, especially from Tensift, High Atlas, Soussthe, Anti Atlas, Bani, and Tafilal. The interior decoration is quite similar to the El Bahia Palace (though slightly less impressive), so if you visit the one, you might consider skipping the other. MAD30 (as of Nov 2018). Ben Youssef Madrassa is one of the largest Madrassas in the North Africa. It is a school attached to the Ben Youssef Mosque and is home to beautiful art and architecture. Admission is MAD20. El Bahia Palace is an ornate and beautiful palace, popular with guided tours and stray cats. The palace is well worth a visit and gives a great impression of what it must have been like to be a 19th century nobleman in Morocco. There is a nice garden with banana flowers, tranquil courtyards, and other lovely plants. The interior decoration is quite similar to the Dar Si Saïd Museum, which is considerably less crowded, so you might want to choose the one or the other. MAD70 (as of Nov 2018). El Badi Palace is now in ruins and inhabited by storks and stray cats. There are some underground passageways to explore. MAD70 (as of Nov 2018). The view from the terrace is majestic. The Menara gardens, which are west of the city, and consist of a mixture of orchards and olive groves surrounding a central pavilion which is a popular sight on tourist postcards. The pavilion was built during the 16th century Saadi dynasty and renovated in 1869. It has a small cafe. The Cyber Park, northwest of the Koutoubia mosque, following the Avenue Mohammed V. An ornamental garden open to the public. Frequented mostly by locals. Very beautiful and well maintained. In the entrance you will find a small exhibit on telephony and communication on Morocco, hosted by Moroc-Telecom, also open to the public. It is a very good place to chill. The old, historic district of Marrakech. 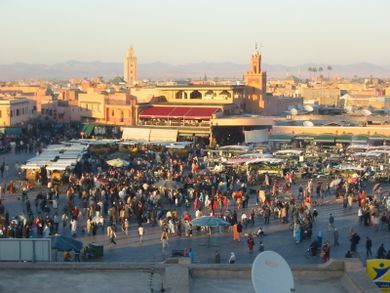 The main square in the Medina is Djemaa El-Fna. It is surrounded by endless labyrinths of souks (bazaars) and alleyways covering all of the Medina. Djemma El-Fna is a must as there is always something to see there day and night whether it be snake charmers, acrobats, sooth-sayers, or the musicians and food stalls (some overcharging heavily). At night the square really comes to life as people navigate toward the exotic aromas and the entertaining sights. As the evening darkens, the hustle and bustle rages on. The exotic music appears louder and more hypnotic. Directly south of the Djemaa El-Fna is Rue Bab Agnaou. A five-minute walk takes you straight to the famous Bab Agnaou entrance to the Kasbah district of the Medina. The Bab Agnaou entrance, through the ramparts, is by far the most impressive of all Medina rampart entrances. The Kasbah, in comparison to the Derbs (streets) surrounding the Djemaa El-Fna, portrays a calmer, less abrasive atmosphere. It is home to the Royal Palace, the former El-Badi Palace and the Saadian Tombs. This naturally creates better security, cleaner streets and a hint of being a special place in the Medina. The Kasbah has its own little bazaars (souikas), food stalls, restaurants, hotels and riads for travelers to enjoy. A Riad is a Moroccan house with an internal courtyard. Most windows are inward facing towards the central atrium. This design of property suits Islamic tradition as there is no obvious wealth statement being made externally, no windows to peer through. Entering a Riad is like discovering an Aladdin’s Cave in comparison to its non-descript exterior. They are great places to stay and offer an intimate and relaxing retreat. Due to its rich history, there are many spectacular Riads in the Medina of Marrakesh. Many of them have been decaying for years. In the 1980th and 1990th, some of them were bought and renovated, mostly by foreigners. The current king, Mohammed VI, who acceded to the throne on 23 July 1999 opened up the country to foreign investors. This unleashed a buying frenzy and by now many riads are in foreign hands and, fortunately, most of them are nicely restored. Many of theses riads are renovated with traditional Moroccan construction methods. The decoration of these riads (lamps, furniture, mirrors, bedspreads, curtains, etc.) are often crafted by Moroccan artisans, some of them still living in the Medina of Marrakesh. Les Bains de Marrakech, 2 Derb Sedra, Bab Agnaou (same building as Riad Mehdi), +212 438 1428 . Tourists-oriented in good sense: couples can have hammam together in a private room. Extensive list of massages and spa treatments from 30 min to a full day. Reception and attendants are proficient in English; the scrubbing and massage personnel speak only very basic vocabulary. Spices at a Marrakech market. The Moroccan dirham (MAD) is officially designated a closed currency, meaning it can only be traded within Morocco. However, they are being sold and bought in travel agencies and at major airports in several countries (notably the UK). The import and export of the currency is tolerated up to a limit of MAD1000. Currency purchased during a visit to Morocco should be converted back before departing the country, with the exception of the MAD1000 level. You're advised to keep the receipts of currency exchange, as these will be required for the conversion back to foreign currency before departure, when you can change as many dirhams as you have left. At Marrakech airport the exchange rate is very similar to that in the town centre, so there is not much lost in waiting to the last minute to change your remaining dirhams. Once through to embarkation you can no longer spend dirhams, only foreign currency, so make sure you have no unwanted dirhams left. Most of the main foreign currencies may be exchanged at a Bureau de Change in the airport or port upon arrival, at a bank, and in most hotels. Smaller hotels in more remote areas may not be able to exchange large amounts at one time without prior notice. Most hotels will exchange at the same rate as banks and without charging commission. Exchanging money in the street is illegal, so travellers should look for an official Bureau de Change which is identifiable by a golden sign. When bringing paper currency into Morocco (US dollars, pounds sterling, euros, etc. ), these must be in good condition -- no tears or ink marks. Do not bring Scottish or Northern Irish sterling notes as they are impossible to cash as are Australian and New Zealand notes. Beware of bringing in brand new designs of banknotes. For example, when the Bank of England introduced the 'Adam Smith' £20 note in March 2007, the Moroccan banks would not change them as their records only showed the older, and at that time still legal, 'Sir Edward Elgar' £20 notes. Don't bring coins in your currency to use as tips. They are hard for the locals to exchange. They get a very poor rate of exchange so have to pester other tourists to try and change them. Some shops, Riads/hotels and especially restaurants quote prices in euros and dirhams; in the days where there were 10 dirhams to the euro it made conversion easy, now €1 is approximately equivalent to MAD11 but some traders still prefer to use the rate of ten to one which means you are slightly overcharged. Some traders will not give change when paying in pounds or euros! If your Riad or hotel has only quoted in euros (many do so to make it easier for guests to understand) ask for the price in dirhams so you can pay in the local currency. Current exchange rates can be checked at xe.com. Please remember that the rates provided by xe.com are for wholesale transfers but are generally close to the exact rates of exchange found in Morocco. Most exchanges do not charge a commission or fixed fee, what you see in the board is what you get. This means you don’t need to plan too far ahead when exchanging, as you can do it little by little as need. Most credit cards are accepted (especially Visa, MasterCard), although surcharges will likely apply as the cost of credit card processing in Morocco is fairly expensive for businesses. Do be aware that only a relatively small amount of businesses in Morocco have the ability to accept credit cards, although the number is growing slowly. Advise your bank or card issuer that you intend to travel abroad so that no block will be put on the usage of your credit or ATM cards. Notify the issuer and give them a phone number where you can be contacted abroad. Before travelling, make a note of all credit card numbers and associated contact numbers for card issuers in case of difficulty. Consider emailing this information to yourself. The numbers are usually free to call as you can reverse the charges. Make it clear to the operator at your hotel, riad, etc., that you wish the call charge to be reversed. Preferably get a pre-paid card, with good exchange rates and low withdrawal fees eg fairFX. When making payments with a credit card, for example at a hotel for services, it is vital to memorise the PIN as signatures in many instances are no longer accepted; certain establishments, such as restaurants, may use the old method of signing. Many people now use a prepaid FairFX or Caxton card. These offer good exchange rates and are safe and money is protected if the card gets lost or stolen. They are accepted in Moroccan ATMs anywhere you see the MasterCard logo and in some shops, too. ATMs can be found in abundance in most towns and accept Visa, Maestro, Cirrus, etc., but these will usually incur charges of around 5%. You should check with your bank as charges for using ATMs abroad may make exchanging cash a better option. Popular destinations such as Tangier, Marrakech, Agadir etc have ATMs in large tourist international hotels as well as on all main roads. The Medina of Marrakech has more than 20 ATMs. Using a credit card (VISA, etc.) to obtain money from ATMs is possible, but interest is charged from the moment money is dispensed. The normal practice of an interest-free period which applies to purchases, typically over 50 days, made on the card does NOT apply to cash withdrawals. Banks will allow cheques to be cashed but must be supported by a guarantee card. Along with the major souk adjacent to the Djemaa El-Fna, there are a plethora of smaller souks throughout the city where any number of products can be bargained for. Keep an eye out for a wide array of hand-crafted candle-holding lanterns, as well as spectacular displays of local spices. Argan oil, produced only in Morocco, is used in Moroccan cooking and beauty treatments. If you enjoy its unique nutty flavor, pick some up in the souks. It will cost you about Dh 70 at local supermarket for cooking oil or Dh 200 for genuine cosmetic oil. Marrakech is home to a large tanning industry, and leather goods of high quality can be bought here cheaply. Check out camel leather items especially jackets, round poufs, and handbags. For shoes, always check they have no paper inside the plate ('sole' in French) because it is very common. Don't be fooled by demonstration of how they bend the shoe and turn it back to the position. Try it yourself by feeling and hearing how the paper bends. For poor quality ones, you shouldn't pay more than Dh 40 and for good ones no more than Dh 90. Shop around and learn the difference between the quality. Also of interest are items made of the local cactus silk, which is really rayon, a natural fiber made of plant cellulose and produced in Morocco. Rayon holds the chemical dyes well which accounts for the vibrant range of true colors (natural dyes cannot produce a "true" color). On offer are scarves, handbags, tablecloths, bedspreads and throws in stunning colors. Some merchants try to charge a premium price for this "cactus silk". Check well because there are many fakes and sellers will usually tell any lie to get you to pay a high price. Wander round the potters' souk, and look for brightly colored platters and bowls, as well as tagines in all sizes. Lovely cashmere shawls can be had for less than a fiver with a little bargaining. If you cannot stand the bargaining, there are two government-run shops where you can buy handicrafts at fixed prices. Look for boutique d'artisans. One is near Djemaa El-Fna while the other one is in the Ville Nouvelle. An option to explore the souks in a more tranquil way is to go during the Friday prayer. Although some shops will be closed, most stay open and are significantly less crowded than at other times. As a guide for prices, maximum and generous prices you should pay. Djellaba, long coat with hood for men, made of cotton/wool. Low quality: MAD90. Good (thick) quality: MAD300. Paintings, depends on the quality and size but no more than MAD50 for a 70x50cm. Shisha, MAD150 for the smallest ones. Prices then vary with size and quality. Tobacco for shisha, MAD20. There are many flavours and decent prices at the duty free store at the airport in Marrakech. Shoes, for home, no more than MAD50 for good ones; for the street no more than MAD90 for good quality ones. Lamp, no more than MAD60 for a medium size lamp. T-Shirt, no more than MAD50 for a large. Small wooden snake toys, MAD5. Small teapot (2-3 cups), MAD90-100. Dress for women, poor quality, not wool, MAD30. You can order special gold jewellery items like a chain with your name on it or using a customised design but agree on the price beforehand. Dishes: you can find small ones with Dh 40 to 60, depending on quality and decorations. Bananas, Dh 8 per kilogram, in season. 250g of gunpowder tea, Dh 30. Round piece of bread, Dh 1,5. Don't bid for a price that you are not willing to pay. Even hostel prices can be haggled. Remember, sellers are just the middle men. They don't produce it, except maybe for some kinds of lamps, and they pay very little to the people who make it. Please NEVER pay in advance. And NEVER let anyone write you an invoice. It's a bad idea and, in most of the cases, you will never see your goods or money back. Each night in the Djemaa El-Fna rows of street stalls are set up under giant white tents. These huts serve similar fare and have menus printed in French, Arabic and usually English. Everyone has tajine, couscous, brochette and soups. Some have specialties like offal, egg sandwiches or special tajines. Be aware that most restaurants employ rather insistent "greeters," who are very aggressive in getting customers for their stall. The line 'we already ate' seems to work well to get them to stop. Be aware that some of the tent restaurants overcharge heavily; you may easily end up with a bill five times higher than you should normally pay. "'Cafe DuLivre'". Rue Tariq Ben Ziad, just off Rue Zoraya near Av. Mohammed V. An English speaker's oasis. This hip cafe has free wifi, a full bar, and designer flavors of tea and coffee. It has an English library of books for sale and to read in house. The menu offers more than the usual tajine and rotessorie chicken. Its not unusual to hear sublime and Bob marley on the stereo or hearing a cool young French or morrocan hipster strumming their acoustifc guitar. Lots of ambient cigarette smoke lingers. They have live music nights and lots of posters announcing yoga workshops and cooking classes. Basically a quintessential backpackers cafe. Cafe Alhamra, Pl. Djemaa El-Fna, opposite Café de France. ☎+212 6504 7411. On the edge of the square, it serves up salads, pizza, and pasta as well as a tagine of the day. Their rooftop is a good place to have a late night coffee and pastry while watching the events in the square below. Cafe Mabrouk (off Djemaa El-Fna) serves the same standard fare as everywhere else in a little courtyard or terrace. Chez Chegrouni, near the main entrance to the market. Maybe the best cheap restaurant in the square. Their vegetarian couscous (Dh 30) is supposedly the only true vegetarian couscous in town; it's bland but they give you plenty of it. Prices go up if you sit on the terrace. Usually packed full of good-time tourists. Chez El Bahia is 50m away from Djemaa El-Fna on Rue Riad Zitoune (the street that starts at Wafa Restaurant). It has excellent and well priced food in a quiet place. Try the chicken and olives tajine as well as the prune, almonds, and mutton tajine for about Dh 45 each. Also try the Moroccan salad while they cook the rest of the food. Chez Yassine is 5 mn north from the Koutoubia mosque, 70 Rue Fatima Zohra Rmila (next to the Bacha hamam). Not much choice but excellent food at rock-bottom prices, served by very friendly people. Tajines (Dh 28) and pizzas (Dh 20-35) are great and you can also order skewers that are not on the menu. Earth Cafe situated in the Medina is vegetarian-friendly. It can be found at two locations quite close to each other: 1) Number 2, Derb Zawak, Riad Zitoun Kedim, ☎+212 6054 4992, +212 6128 9402. Vegetarian meals. 2) Derb Nakous, Riad Zitoun Jdid. Vegetarian and chicken meals. Also available are vegan alternatives and plenty of options for fruit and vegetable-based drinks. Le Marrakchi is opposite the market and adjacent to the newspaper stand. With two main courses and wine running at around Dh 300, this is one of the poshest restaurants in the square. The food is not necessarily better than elsewhere, but it is one of the few restaurants that serves alcohol. It also has a completely enclosed upstairs terrace, which is ideal for views of the square when the weather is bad. Vegetarians will find that there are few options outside the ubiquitous Tagine avec Legumes. For more upscale eateries (and especially for non-Moroccan cuisine) you generally must go outside the Medina to Ville Nouvelle. However, Diaffa (Rue Jbel El Akhdar just off Av. Mohammed V, across from Club Med), is an upscale restaurant in one of the oldest buildings in the Medina, and offers excellent Moroccan cuisine in an ambiance that recalls the Orient at the height of its magic and glory. The food, building (whether the tables around the central courtyard and fountain or the second-level balcony), and tactful and tasteful entertainment are all not to be missed. If you want to eat well in Marrakech, do what the locals do and eat at the food stalls in the square. It is a common misconception that these stalls are here for the tourists. Actually, they have been in existence long before Marrakech became a tourist destination. All of the stalls can be regarded as perfectly safe to eat at. They are strictly licensed and controlled by the government, especially now as it is a popular destination for tourists. Be extremely careful when deciding whether or not to eat here. Mathematical "errors" are often made by staff when they're making the bill. So-called "freebies", like olives and bread (which are supposed to be free), which incur a 5-10 Dirham charge. Smaller portions are often served to tourists. It's a long list of what the staff will do to try and rip you off. The staff may appear very friendly and witty, but it's all pretense. They want your money and will do what they can, even cheat and lie to you, to get it. You have been warned. Most stalls have extremely aggressive and pushy touts trying to get you to eat at them. They will block your passage which can make for a very uncomfortable experience. Prices tend to vary a little. Depending upon how hungry you are, you can pay anything from Dh 10 for a bread filled with freshly grilled sausages or perhaps a bowl of harira soup to Dh 100 for a full three course meal with salad, bread, starter, main course, and tea. There are some real scams, though, such as being charged Dh 470 for some mediocre street food for three. Try harira (great soup, of lamb/beef, red lentils and vegetables) and the fried aubergines. Don't be afraid -- try the lamb head: it's really tasty. The "bull stew" (beef stew) should also be given a chance in the same stalls. Don't miss the tea! There is a row of tea sellers along the front of the food stalls who each sell tea for about Dh 5 each (as of April 2013). Most of the tea at these stalls is ginseng tea with cinnamon and ginger... most delicious and welcoming. They also have cake, made of basically the same spices, which can be a bit overpowering. All food stalls at Djemaa El Fna display the price on the menus, making it less likely you'll be overcharged, but many will bring starters to you without asking, then charge for them at the end. The orange juice stores sell fantastic orange juice, although there are times when lemonade had probably been added. The price in April 2013 was 4 Dirhams, although they sometimes try and charge 4 Euros, or 4 pounds sterling, or 4 US dollars! Drinks are rarely on the menu so it is better to ask the price of them before ordering, as they can often be comparatively high. On the other hand, some stalls offer free mint tea to encourage you to choose them. Early mornings, look for people frying riifa in the covered part opposite the Koutoubia. Riifa is dough stretched and flattened and folded over, then cooked in a frying pan, and is best described as a Moroccan version of a pancake or crepe. Street vendors offer fresh orange juice (jus d'orange) by the glass for Dh 4. Try it with a dash of salt like the locals, but be wary of vendors who try to water the juice down with tap water. Also, pay attention when you buy as they offer 2 types of orange...the blood orange juice costs Dh 10 per glass and a misunderstanding on what you want to drink could occur. Confirm the price of your orange juice and pay for it before you drink. Unscrupulous vendors will sometimes try to charge you Dh 10 for a Dh 4 glass of jus d'orange, so don't accept your drink until you've paid the correct amount. They do not always clean the glasses very well. It is possible to get an upset stomach from the juice. However, many vendors will give you the juice in a plastic cup instead of glass for 1 Dh extra. There are many beggars in the square, and they will watch to see if you buy a juice, then hustle over and demand the change, or a glass of juice for themselves. There is a very limited selection of places selling alcohol in the medina. Cafe Arabe, Rue Mouassine Medina. ☎ +212 2442 9728. Features a hip lounge and restaurant that is bliss on a hot Moroccan night. Arabic music plays as you sit on plush seating while attentive waiters serve you. With a modern cuisine that is a welcome change from tagine and couscous, sitting in the terrace on a hot summer evening with water mist sprays from the ceiling is truly a luxurious experience. Chesterfield Pub (in the Hotel Nassim), 115 Avenue Mohammed V, A slightly unusual experience, apparently an 'English pub' it serves Moroccan lager and has an outside pool in a courtyard with palm trees, not an entirely English experience. Much less touristy than it sounds with a mainly local clientele. It serves a decent pint. Hotel Tazi, Rue Bab Agnaou. The hotel has a public bar, serving beer and wine and is not overly expensive. Narwama, Hay Zefriti 30, Rue Koutoubia. ☎ +212 6 7250 8700. Restaurant and bar that has a fire fountain in the centre and an open roof around the patio. The atmosphere is very chilled and their food is very good, but slightly expensive. This place is better for pre-dinner drinks. Dar Nejjarine 35 Derb Sharji. ☎ +212 5243-75002. Serving typical Moroccan food on a rooftop terrace, but can also be enjoyed just for the drinks, as the menu contains alcoholic beverages. Guéliz, the newer part of the city, has several places where one can sit down for drinks. In keeping with the local culture, alcohol is kept out of public sight and places serving alcohol do not advertise it openly. If you are looking for a place that serves alcohol, look for the telltale signs: if the word "bar" is mentioned next to the place name (instead of just cafe/bistro), it will most likely have alcoholic drinks on the menu. A curtain protecting the entrance outside is another telltale sign. Keep in mind these places usually only open in the evening. Carrefour, The supermarket in the basement of the Carre mall west of the Majorelle Gardens sells alcohol from a specific room. Local products are considerably cheaper than imported with wines being relatively much cheaper to buy than beer. Marrakech has an amazing choice of places to stay ranging from tented camps outside Marrakech to cheap hostels and hotels that can be charming or seedy to luxurious kasbahs in luxurious gardens or the traditional riad (garden courtyard) hotels. Wherever you choose (or can afford) to stay it really is a must to visit one of the riad hotels to see this amazing style of architecture. Most riad managers will be happy to show you around provided that they are not too busy. In some riads you can book a lunch or dinner without being a resident provided that the riad is not privately rented. For example see Riad Cinnamon, Riad Laksiba and Riad Papillon. There are three main zones to sleep: Medina, Guéliz (also known as Ville Nouvelle), and the surroundings of the city. The Medina has the highest concentration of very cheap hotels and riads (small palaces), while Guéliz is much more quiet and most of the hotels are mid-price (including showers in the room, breakfast service), but going to the Medina from the Guéliz by taxi costs about MAD10-15 and can take a long time at busy periods (evenings and weekends). The surroundings have all the huge tourist hotels, the ones that usually come with what the travel agencies offer. They can be further away from the Medina and the rest of the city but have big swimming pools, restaurants, and many services. Next to the Bus Terminal, just behind the City Walls, there are two Hotels with prices around 60 Dh per Person and Night. Both are basic but reasonable for their price. The cooling effect of a Riad's courtyard is no accident. A water feature at the base of a Riad courtyard serves two purposes. First, as the obvious focal point. And, more importantly, the courtyard's open-air aperture channels warm air entering into the Riad which passes over the water feature, cools down, thus assisting in the convection of heat to exit back through the Riad's open-air opening. This style of natural air-conditioning has been prevalent in Morocco for millennia and is remarkably successful. The Medina is packed with Riads and Dars (old grand houses converted into hotels and inns). Riads should have gardens; smaller Dars have open courtyards. However, the term Riad is used very loosely today to describe a house with an internal open-air center. These are wonderful places to stay to get a feel for life in Marrakech. Bliss-Riad 182 Rue Mouassine, Dar El Bacha, Medina, ☎ +(212) 6 15 31 20 49 ([email protected]). Featuring free WiFi, a restaurant and a sun terrace, Bliss Riad offers pet-friendly accommodation in Marrakech. All rooms are fitted with a private bathroom. For your comfort, you will find slippers and a hairdryer. There is a 24-hour front desk and gift shop at the property. The Riad also offers Spa-Hammam services, bike hire and car hire. Museum Dar Si Said is 700 meters from Bliss Riad, Museum des Amis de Marrakech is 400 meters, while Cooking School is 700 meters away. Located 5 km from Marrakech-Menara Airport. 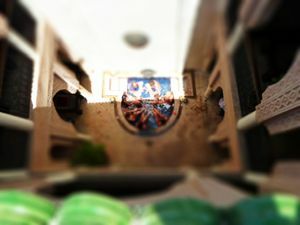 Riad Linda, 93 Derb Jamaa, Derb Dabachi: in a peaceful derb near Djemma el Fna & the souks. +212 524 390 927 [email protected] checkin: 'flexible', checkout: 'flexible'. Can sleep up to 14 people, available for exclusive rental as well as individual rooms from UK£55 per night; rates inclusive of breakfast and all taxes. Riad Linda has been lovingly restored by local craftsmen using traditional techniques and resources to combine comfort and modern facilities with traditional Moroccan decorative features. On the ground floor, the entrance corridor, with decorative archways and alcoves opens into the central courtyard which is surrounded with plants and traditional Arabic decor. There is a salon with traditional Arab cushioned seating around a decorative waterfall. There are also double and twin, en-suite bedrooms which are wheelchair accessible. Ryad Dyor, 1, Driba Jdida, Sidi Ben Slimane 40 000 Marrakech: Ryad Dyor is located in the north part of the Medina, at Sidi Ben Sliman, one of the most authentic and traditional areas of the ancient Medina, 20 minutes drive from the airport, 10 minutes drive from the two golf courses, Amelkis and Royal Golf (10km), and 15 minutes walk from Jamaa el Fna Square, the famous square of Marrakech, 5 minutes walking distance to the Souks (market with little shops. Tel Ryad +212 524 375 980 [email protected] checkin: 'flexible', checkout: 'flexible'.Ryad Dyor it's converted from a pair of riads, whose 2 shady courts lead into each other, one with an ornately tiled fountain, the other with a rose-petalled splash pool. Seven suites and rooms bristle with design details: copper lanterns, Balinese mirrors, egg-smooth tadelakt bathtubs. Up on the roof, under a loggia hung with gauzy textiles, the manager knows just when to offer cocktails or mint tea to guests lazing in the afternoon sunshine. The laid back atmosphere - everyone is made to feel at home, nothing is too much trouble.All suites include: king size beds with pocket-spring mattresses, hot/cold air-conditioning, flatscreen TV with DVD player, DVD collection, iPod station, electronic safe, mini bar, yoga mat, hair dryer, complimentary tea/coffee making facilities, fruit basket, and warm and friendly English-speaking staff. Dar Habiba, 18 Derb Jdid, riad zitoun k'did district (5 minutes straightforward walk from the main square), ☎ "+44 ([email protected]), . checkin: flexible; checkout: flexible. Dar Habiba is a traditional secluded Riad. One suite and five rooms sharing a romantic courtyard minutes from the famous Jemma al Fnaa square..
Riad Naila Marrakech Medina, ([email protected]), . Riad Naila is an award winning private rental home in the Medina of Marrakech built around a patio with a large roof terrace. It is located in a calm area a fifteen-minute walk away from the famous Jemaa El Fna square. Riad Naila has four bedrooms which sleep seven persons. Each bedroom has its own bath room. Additionally are available a fully equipped kitchen, a Moroccan lounge and a library. The daily price of 140€ is for the entire house. Dar rhizlane Avenue Jnane El Harti - Quartier De L'Hivernage, Marrakech, Maroc (2 km from Jamaâ El Fna Square), ☎ 00212 5 24 42 13 03 ([email protected], fax: 002125 24 44 79 00). True echo with the thousand exhaled scents, grabbed with the liking of a dawdling in the varied succession of the universes landscapes. Each room has its own theme of decoration defined by its well marked and underlined choice of specific colours, as well as a privative garden or a terrace, inspired by the spirit of the consecutive patios of the palace. Three spaces of the palace dedicate their interiors to full continuations. The budget conscious will have more luck in the streets and alleyways south of Djemaa El-Fna, which are packed with discount hotels offering singles from Dh 50. Derb Sidi Bouloukat is a good place to look, a quiet but safe alleyway packed with traditional-style hotels just a min from Djemaa El-Fna. Its entrance is easy to find, just a few steps away from Djemaa El-Fna. Take Riad Zatoune (unmarked) which starts right of the Moroccan Red Crescent (with your back towards the Koutoubia) and it's the first alley on the right (marked in Arabic only). On your way in Riad Zitoune you will also come across the public hammam (Dh 10, left entrance for women, right entrance for men, the soap, glove and small bucket can be bought at many shops across the street) and a small restaurant serving bissara and mint tea for less than Dh 5. Be aware that in the hotels just off of the Djemaa El-Fna, there's a good chance that the frenetic music in the square will continue until around 3am, and it's likely to be quite audible from your hotel. Djemaa el fna Hotel Cecil , just a few steps away from Djemaa el fna, down Derb sidi Bouloukat. It's highly reviewed and commented on, popular with families and backpackers, with a Rooftop terrace overlooking the square. Private rooms with private bathrooms and air conditioning are available for 150.00 Dirham per person, per night including breakfast and free wifi. Marrakech Hotel Cecil 2 , in the same building as Hotel Cecil, just a few steps away from Djemaa el fna, down Derb sidi Bouloukat. With a Rooftop terrace overlooking the square. Private rooms with shared bathrooms are available for 110.00 Dirham per person, per night including breakfast and free wifi. Hotel Ali , Rue Moulay Ismail. Beds in ensuite, dorms, and rooftop terrace mattresses for Dh 60 per person per night, including cooked breakfasts served with OJ and fresh coffee. Dorm guests can use the internet cafe for Dh 5 per hour. They have all the amenities a backpacker could ask for, including a laundry service and free internet access for private room guests, money exchange, a terrace restaurant with views of Djemaa El-Fna, and even a downstairs hammam. Private rooms are available with a maximum per person price of Dh 250 per night including breakfast, free internet, and a daily traditional Hammam. Hotel Atlas , 50 Derb Sidi Bouloukat, ☎ +212 5 2439 1051 [email protected]. A 2 min walk to the famous square of Djemaa El-Fna. Clean and friendly with nice rooms with shared bathrooms. Singles from Dh 90, doubles from Dh 170, for 3 people Dh 250, for 4 people Dh 280, for 5 people Dh 320. There are some rooms with AC for an additional Dh 50. The hotel is charming and all arranged in the traditional way. Hotel Central Palace (59, Sidi Bouloukate) near Djemaa El-Fna. Rooms are around a noisy and echoey central courtyard. Rooms are clean, but the shared toilets can be another story. Indifferent staff and housekeepers. Nice terrace with a great view, and rooms starting at Dh 150 for a double room with shared showers and toilet. You get what you pay for, but all in all it's a good value considering that Marrakech is more expensive that most other places in Morocco. Car rentals can be arranged (around Dh 350 per day for a small but fairly new car). Hotel el-Ward, 65 derb Sidi Bouloukat, ☎ +212 5 2444 3354. Clean, quite comfortable, and the owners are very friendly whenever they feel like it. The rooftop terrace isn't lavish, but being one of the highest it does have a great view. 60/120/170/220 for single/double/triple/quadruple. Hotel Essaouira , 3 Derb Sidi Bouloukat, ☎ +212 5 2444 3805. The hotel has singles with a shared bath from Dh 50 and doubles from Dh 90. It's more or less like the others, but it's all painted in the traditional way, which gives it charm. Toilets and showers are bare-bones, a norm at this price range. Hot water doesn't stay hot for long. Overall a very good value and comfortable place from which to explore the old town. Hotel Imouzzer , 74 Derb Sidi Bouloukate ☎ +212 5 2444 5336 [email protected] One of the cheapest and best-value hotels with rooms starting at Dh 65 for singles and Dh 120 for doubles (slightly higher in high season), all with shared bathrooms. Rooms are arranged around a traditional courtyard, and both rooms and shared bathrooms are clean with hot water. The hotel also has a comfortable terrace where you can eat breakfast for Dh 20. Hotel Mimosa Rue des Banques, 1 minute from Jaama el Fna making it the perfect location. Basic but clean rooms. Single 100Dh, Double 150Dh and triples available. All with shared bathrooms which are cleaned well once a day though can get dirty by night. Hot showers and free wifi with connection reaching the rooms on ground floor (but not on the upper levels). Terrace with views of Jaama el Fna below. Hotel Smara, 77 sidi Bouloukat, ☎ +212 5 2444 5568. Near Djemaa El-Fna. Very clean, friendly people, nice rooms. Dh 50 and doubles Dh 80. Palm Plaza Hotel and Spa Located in Agdal, a new residential district, 10 mins from the airport. Luxurious and comfortable providing 230 rooms, including 151 twin, 52 double, 2 rooms for disabled persons, 6 junior suites, 20 senior suites and a royal suite. The hotel has a piano bar, night club and a restaurant. Snacks are available at the pool bar. The spa features a heated indoor swimming pool, a sauna, a hammam and a gym. Riad Lyla , In Laksour district, just two mins from the famous Djemaa El-Fna, Lyla Riad Marrakech opens its doors. Gérard is the riad's passionate owner. Riad Rahba . Offers private, en-suite rooms and is located a minute from Djemaa El-Fna, at the entrance to the Souks. The Riad combines the traditional Moroccan atmosphere with the comforts of a modern hostel and hotel. The rates include breakfast and wifi. From €18 per single ensuite room per night. In the little streets between rue Bab Agnaou and rue Riad Zitoune (where the Smara, the Essaouira, and the Imouzzer are) there are a lot of other small hostels. It is difficult to get lost as they are surrounded by these two big streets and Djemaa El-Fna. It could be a good idea to arrive during the day (best in the morning) and wander around comparing many hostels in a short time. Palm Appart Club Marrakech Avenue du 7eme Art , 40000, Marrakech, Maroc (In front of Almazar Mall), ☎ +212 524 37 72 00 ([email protected], fax: +212 524 37 64 50). A contemporary address which has 107 apartments with a modern and minimalist decor, fully equipped and in different sizes to meet all requests for accommodation. Hotel al Kabir, Corner of bd. Zerktouni and rue Loubnane, ☎ +212 2443 9540, +212 2443 4150. This modern, airy hotel is one of a group of similar standard hotels in this area of Guéliz. Mainly used by tour groups and reservation agencies, the Hotel al Kabir's rooms, accessible from three elevators, are all clean, modern, and well appointed, if a tad sterile, and the bathrooms are a reasonable size with shower/tub combos. Prices: Dh 291 for a single; Dh 382 for a double. Hotel Ibis  ☎ +212 5 2443 5929. (Near the train station) is a more impersonal European chain hotel, but very clean and peaceful. It's within a short taxi ride of all the action. If you want to be able to escape the hustle and bustle during the heat of the day and chill out by a pool, this place is perfect. Decent value for the money as well, with lovely rooms and showers. Free internet with wifi is provided in the lobby. Hotel le Caspien , 12 Rue Loubnane, Gueliz. ☎ +212 024 42 22 82/83, Fax: +212 024 42 00 79. Nice, comfortable and clean hotel with helpful and friendly staff. Breakfast is included. Rates Dh 460 single, Dh 580 double. Moroccan House Hotel 3 rue Loubnane, ☎+212 4442 0305, +212 4442 0306. A colorful and personable hotel. As the name suggests, this is more like a house than a standard block hotel. The extravagantly painted and decorated interior is entered through bright blue heavy wood studded doors. Choice of various brightly colored interiors furnished with faux-antiques and lace-draped four-poster beds. Each bathroom has its own water heater and bath/shower combo, and comes supplied with a range of complimentary toiletries. Close to many of Guéliz's better restaurants and shops. 3-star rooms start at Dh 405 single, Dh 484 double; 4-star Pacha suites: Dh 455 single, Dh 624 double; 5-star Prince suites: Dh 527 single, Dh 764 double. Villa Dar El Kanoun , Route de Targa. ☎ +212 2449 2010, Fax:+212 2434 0635. Luxury B&B villa with swimming pool and garden. It offers five comfortable double rooms in a quiet residential area nearby Marrakech downtown. Breakfast is included. Rates begin at Dh 1,000 for a double room. Violent crime is normally not a major problem, but thefts are known to happen. Keep your money close and hidden, and avoid poorly lit streets or alleys at night. Guides offering their services should display an official badge from the local tourist authorities. Morocco is under an increased threat from international terrorism. Be vigilant when you're out and contact authorities if you notice anything suspicious. Be especially careful about being drugged, especially as a solo traveller. The common and easy-to-make drug GHB only lasts three hours and is undetectable in the body after 7 hours, so if you are attacked, take action immediately. Be careful ordering room service if you are a solo traveller, as even older women can be targets for robbery. Don't ask the waiter to enter your room. Be especially careful in the Guéliz (New Town) area when walking at night - muggings and bag snatches, often at knifepoint, by men on motorbikes are common when leaving the bars and restaurants. If driving in Marrakech be very careful to observe roadsigns and traffic regulations. Although the traffic seems chaotic, the police are very keen on stopping foreigners and will not hesitate to impose on the spot fines (especially if you have left your driving license at the hotel). Marrakech has many stray cats. These do not pose an immediate threat to most travelers (they are not aggressive) but do have a high risk of carrying fleas in their fur. Some of the tent food stalls in Jamaa el Fna will overcharge you heavily, e.g. giving you a bill amounting to Dh 470 for just some mediocre street food for three. Beware of restaurants that are not full of locals, and always check the prices beforehand. The tap water in Marrakech is OK for bathing. While locals drink it with no problems, visitors often find it hard to digest. To be safe, opt for bottled mineral water, available at the marketplace kiosks and food stalls. Make sure that the cap seal has not been broken, since Moroccan vendors have been known to save money by refilling plastic bottles from the tap. At restaurants, ask for your drinks without ice cubes, which are usually made with tap water. An important issue concerning toiletries in Marrakesh, and the cities around as well, is that, in general, commercial establishments, cafés and restaurants also, do not have toilet paper in their bathrooms, even in ladies's rooms. So a good practice is always to carry toilet paper with you. If you look like a tourist, then it is common for people to offer to help with directions or even lead you to what you are looking for. Although not apparent at first, these people expect to be paid and will often lead you round in circles to increase the amount. Be careful when exiting your taxi, scammers may grab your luggage from the trunk while posing as bellboys from the hotel, so confirm their identity before letting anyone touch your bags. Also, people may say that the place you are looking for is closed, but they will take you somewhere else that's better. This is almost always a lie. The best people to ask for directions are people behind a counter, as they cannot lead you because they don't want to leave their stall. If you are seriously lost, getting someone to lead you back is an option, but you should not give them more than Dh 10-20, no matter how much they complain. Moroccans are not permitted to be guides for foreigners without a license. Usually Police officers (under cover) are patrolling to catch Moroccans who are bothering tourists or try to make some money. There are often people in Djemaa El-Fna offering henna tattoos, which are popular with locals and tourists alike. But among the many genuine traders are one or two scam artists. They appear very charming and trustworthy while you choose a design, but will then cleverly divert your attention. Before you know it, you have the beginnings of a rather poor henna tattoo. Even if you do not want a design, keep your hands away from them as they will grab your hand and begin a design anyway. The scam artist later demands massive payments, in whatever currency you have (dirhams or not). After emptying your pockets, if they consider you can afford more, they will demand that you visit a nearby ATM. Always agree on a firm price before work starts. If you can't do this, insist that the operator stops immediately -- then go to another (hopefully more reliable) operator to get your design completed. If they say it is free before they start or while they are doing it, they will always ask for a price later on. If this happens to you, you can walk away without paying; however, they will harass you for a little before giving up and moving on to another tourist. Also, there have been stories of these scam artists using henna mixed with dangerous chemicals, such as PPD (this is sometimes done to make the tattoos appear black), which can cause skin damage or severe allergic reactions. Some tourists encounter an elderly lady offering henna in the main square - she welcomes you to her stall, and then fetches her friends (who arrive, usually, on motor bikes) and will provide you with very appealing tattoos - however, beware - they will not agree a price upfront and will ask for huge amounts - e.g. a 50Dh tattoo will be 450Dh - or they will promise you free tattoos and then charge equally large amounts. When you dispute the amount they will scream at you - so be calm, pay them what you think it is worth, and walk away. If they try to stop you then create attention - however, do not use physical violence as these artists work in gangs and before you know it you'll be surrounded by other con-artists. There is a small nameless restaurant inside the markets catering to tourists. It looks like a budget restaurant but has extremely inflated prices. It has an awning with painted faces and offers grilled brochettes for Dh 40 each, which is much higher than the regular price. Most Moroccans are tourist-friendly and are not aggressive, so sometimes making a fuss in public can generate unwanted attention for a scam artist and shame them into backing off. When bartering, know what currency is being quoted. Some sellers quote in euros while allowing the buyer to assume dirhams, hoping they may be embarrassed/confused into making the sale anyway. Make sure you agree to a price before getting into taxis. Use a fare calculator to get an idea of what you should be paying for your trip. By registering in person or online, citizens can make it easier for their country's embassy to contact them in case of emergency. Report any crime to the local police and your embassy. Most other foreign embassies and consulates in Morocco are in Rabat, with a few more in Casablanca. There are many dry cleaning shops inside and outside of the Medina. It takes only one day to clean and will cost from Dh10-30 per piece. If you stay at a hotel, you can hand your dirty clothes to a housekeeper. Usually they wash it by hand. They do not have a price list and usually say "up to you". You should not pay more than Dh 50-100 per plastic bag. 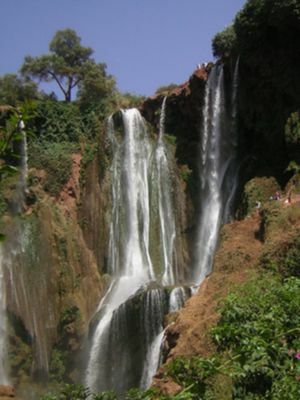 Marrakech can make a good base for exploring the High Atlas can book activities and excursions. Many trips can be done easily and inexpensively with public transport. Also rental cars are relatively inexpensive, and driving in Morocco is easy (with some care required because of the narrowness of the roads. Visit the desert: One of the best experiences to really not miss when you are in Marrakech. You can go to the Erg Chebbi or Erg Chegaga dunes and spend one night or more there. It's an exotic and authentic experience. Visiting Erg Chebbi involves a long car trip, and is best done by a public bus or a rental car, with overnight stops in places like Ouarzazate, Tinerhir, and Boumalne du Dades (one in each direction), and at least two nights in Merzouga. Agadir - On the Atlantic Coast this is Morocco's main port city and is about 2 and half hours drive from Marrakech. The city was destroyed in the 1960 earthquake and was rebuilt in a modern 60s low-rise style. It has wonderful beaches and is much cooler than Marrakech, perfect for those who want to relax on the beaches, wide range of restaurants, bars and clubs, world class golf courses and has all the facilities that the modern tourist demands. Essaouira - A fortified town on the Atlantic coast of Africa, about 3 hours by car/coach from Marrakech. There are many tour companies that run day-trips from Marrakech and, unless you are planning a golfing holiday at one of Essaouira's resorts, one day is more than enough. The biggest attraction here is the small Medina, which is a much more pleasant experience than the Marrakech Medina -- with almost no harassment from traders, scam artists or pan-handlers. There is a beautiful beach to enjoy and you can explore the 18th century port. Imouzzer The traditional small Berber town high up in the Mid Atlas. The natural beauty is outstanding. Whilst only 60km from Agadir it is up steep mountainous roads and the journey is not for the faint hearted. During the spring the waterfalls are at their best. Famous for honey, carvings and argan oil. Amizmiz - With one of the largest Berber souks in the High Atlas Mountains every Tuesday, Amizmiz is well-worth a trip. This is especially true for those travellers wishing to experience the less urban, less touristy mountain towns of the High Atlas. Asni - A lovely rural village in the Atlas mountains. Oukaimeden - Ski lift at 3268m. The snow falls in the mountains just south of Marrakech every winter. And it stays. Wealthy people from all over southern Morocco have since long learned to enjoy skiing in their own country. This has given the ski resort, Oukaïmeden, a distinct Moroccan touch, too. You don't need to bring your ski equipment from home, all you need can be rented. You should only pay around MAD250 for a full day here (including a lift pass). Oukaïmeden and the areas around are some of the greatest in Morocco, with four seasons, and ever-changing nature. In summer, few people enter this area -- it is probably too well known for winter sports. But staying here a day or two is a real treat. 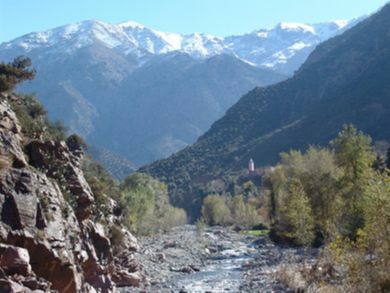 Ourika Valley, in the Atlas Mountains. Tours involve stopping several times en route to the valley to look in tourist shops, a Berber house, and a collective run for women who make products out of Argan oil -- all very interesting! Tours will include a walk to visit the waterfalls. The journey can become difficult, so wear good walking and/or climbing shoes -- suitable footwear is imperative. Think of clambering up rocks at the side of the river and eventually criss-crossing over wet rocks to travel up the mountain. Setti Fatma. A village at the end of the proper motor road up the Ourika Valley. The residential part is above the road and is not visited too much. The attractions are the lovely valley scenery and a walk to seven waterfalls -- or for most day visitors one waterfall from which the others can be seen. Jebel Toubkal, highest peak in the north Africa with it's altitude of 4167m is a destination for many tourists. The main season is in spring but it can be climbed all year round. The hike is recommended to split in at least two days, night can be spend in one of two refuges. You can either take a tour which usually involves a mules to carry luggage or you can do it by yourself. Note that recently rules were changed and as of (Mar 2019) a guide necessary to hike up Toubkal. Some tour operators offer customized itineraries and trips, including advanced booking in hotels, riads, etc. most of the drivers are fluent in foreign languages. The standard „3 days, 2 nights“-Sahara tour can be negotiated down to about 600dhs („official price“: 89€; Feb. 2017). This page was last edited on 22 March 2019, at 12:18.